At the heart of a typical farm Bretonne, we welcome you for your holidays in a Longère in stone with a wooden terrace, covered and lit (20m ²) closed garden (gate not present on the photo) in private grass, entirely renovated in 2013 /2014 ! A backdrop of stone and wood for a gentle and quiet stay near the sea. It has all the comfort (quality bedding, fully equipped kitchen, flat screen HD, DVD player, garden furniture, wireless broadband, barbecue, sunbathing ...). The beaches and ponds are accessible on foot or by bike from the farmhouse by a small path. The small fishing port of Pointe de Trévignon is 1 km from the cottage, accessible by a footpath, you can walk there and buy fresh fish and seafood. For lovers of hiking or cycling, you can start your circuit of several hours between sea and countryside from the farmhouse. During your tour, you will discover protected natural sites, the famous thatched stone cottages, chaos of rocks and many streams in a quiet and privileged environment !! 15min by car, you can discover the city of Concarneau, its Ville Close, its large fishing port and marina, restaurants and its large market on Friday! A 15-minute drive is also the city of Pont Aven, famous for its salted butter cakes but also its many art galleries. You can also go up the lobster traps at Glenan with a fisherman friend who will make you discover this extraordinary archipelago !! The cottage was nice enough and in a pretty rural location near the beach. We would return to this area. We were not happy however with the hosting. We arrived early evening following a 13 hour drive from Cannes. We rang an hour ahead and the host asked if we had brought sheets. We hadn’t as the booking stated linen was provided. He advised we would have to hire them from him. When we arrived in the village we couldn’t find the cottage as irs not signposted or visible from the road. The website guidance does not provide sufficient information so we had to ring the host again. He appeared irritated as he was with his children. Eventually some young people from the village helped us locate the property. The bedding was left on the worktop in the kitchen. It consisted of a single sheet, double duvet cover and two pillowcases. The single fitted sheet was useless for a double bed so we had to use our picnic blanket on the bed. There were no towels. We tried to see the host twice the following day but he was out. We tried again after two nights and he was still unavailable so we text him to request a double sheet. We did not meet him until the following day when my husband saw him working in the barn and went to introduce himself. During our stay we had no information about the property or the area. We felt incredibly unwelcome. This spoiled our holiday and we would not return. The host may have tried to see us during the first few days but we don’t know as he left no messages or offered a time to meet. We left after our fourth night. Only then did we receive two text messages asking had we had a good time and was there a problem with the cottage. This concern came too late. I rarely write a review but felt I had no option on this occasion. I hope others who read this ensure they have bedding, towels and appropriate expectations. The photos on the website are exactly as the chalet is.It is perfect for 2 people,the lounge and kitchen area are in one but both fully equipped,although small its perfect for two.The bedrooms are also small but we slept well every night.The patio is private with a nice table and barbecue which we used frequently.The shower is also good with a nice large sink.We had free WIFI which enabled us to watch films off our tablets.Ronan was very communacative showing us around the apartment and was there for any questions we had.Trevignon is a lovely place with nice beaches and a couple of nice restaurants.I would like to thank Ronan for having us and being friendly.We both had a fantastic time in Trevignon. La preuve... j'y reviens... et j'y reviendrai ! 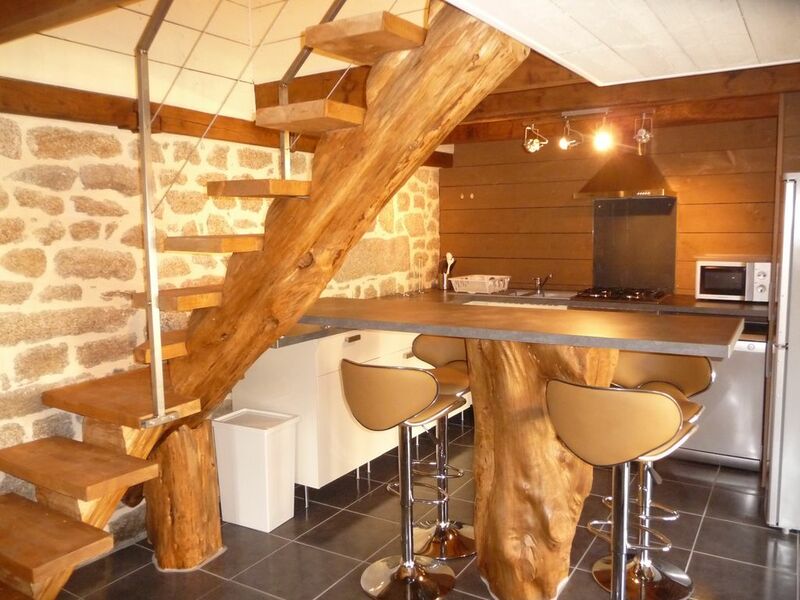 Nous avons passé un excellent séjour dans ce gîte confortable, décoré avec goût.